Child size Irish earrings feature shamrock studs with a rhodium plated finish along with green enamel accenting. This Irish child size jewelry, like all the Irish made jewelry at The Irish Gift House, is nickel free and hypoallergenic. These shamrock earrings for children feature a rhodium plated finish with green enamel accenting. 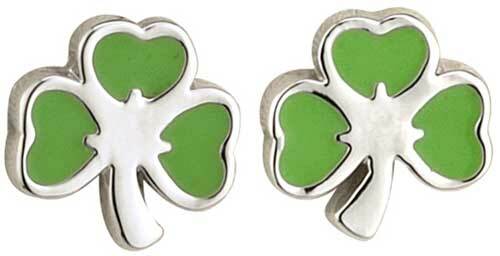 The child's shamrock earrings measure 3/8" wide x 3/8 tall; they are a stud style on posts with push on butterfly backs. This child's Irish jewelry is made by Solvar Jewelry in Dublin, Ireland and it is gift boxed with a shamrock history card, complements of The Irish Gift House. Child size Irish necklace features a shamrock with a rhodium plated finish along with green enamel accenting. Child size Irish jewelry set features a shamrock necklace along with shamrock stud earrings. 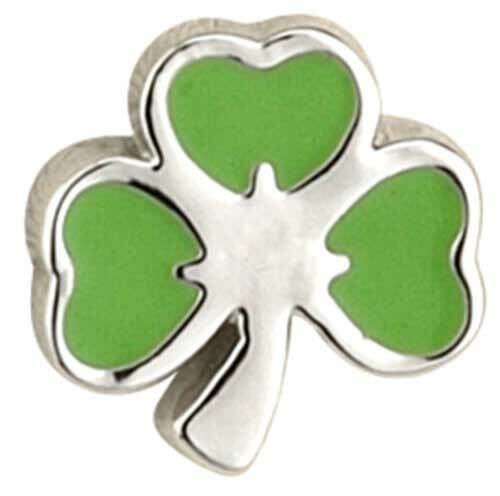 Shamrock stud earrings are cast in sterling silver; they are an ideal size for a baby or child. Irish baby necklace features a sterling silver shamrock.